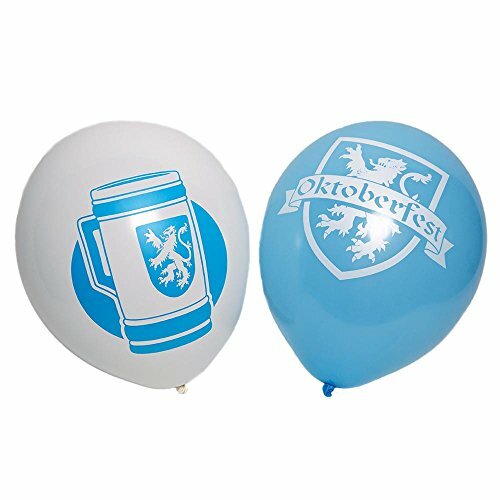 Bring the spirit of Munich to your party supplies when you inflate some of these Oktoberfest Latex Balloons. 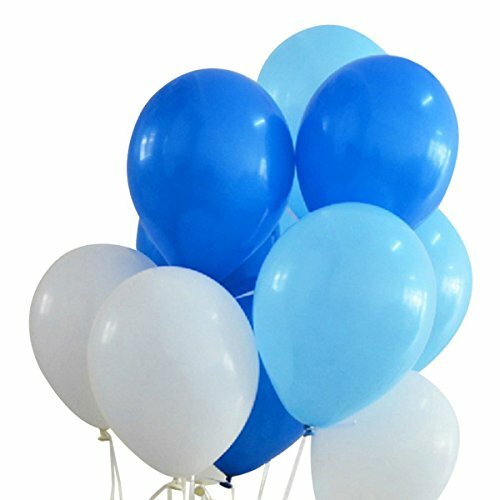 Printed in baby blue and white, these latex balloons are sure to help you set the scene for your Oktoberfest celebration. Fill them with air or helium and scatter them around your party space. Or, tie them together and make your own table centerpieces. 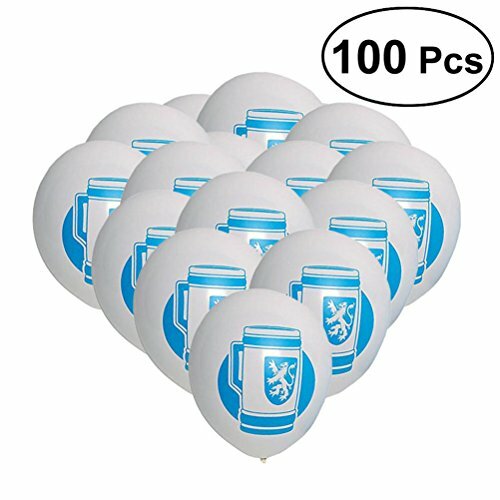 11"
Package included: 100 pcs （34 white/33 blue / 33 Light blue）balloon color distribution evenly. Looking for some decorations for birthday party or Wedding, Bachelorette, Bridal Shower, Engagement Party? 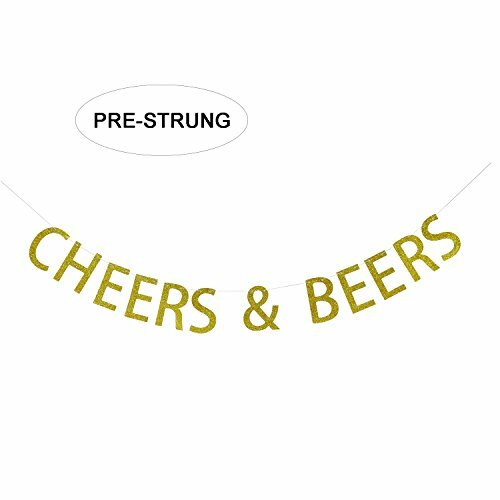 Here this adorable "CHEERS & BEERS" banner would be a good choice for you. Good reusability The banner can be used many times thanks to its premium material, you can have it for keepsake or give it to your friend or colleague to make best use of it. It also folds easily for storage. Perfect length of rope The length is about 3 meters, this allows you fix the banner anywhere easily, and you can adjust the gap between the letters freely. Note As the banner has been pre-strung for you, please unfold it carefully, or you may damage the letters. 100% satisfaction guaranteed If you are not happy with your purchasing, free to contact us, we will give you full refund. Click "Add to Cart" to buy it now ! 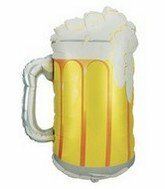 Accent your St. Patick's Day or alcohol themed party with this large unique shape 34" Frosty Mug foil mylar balloon. 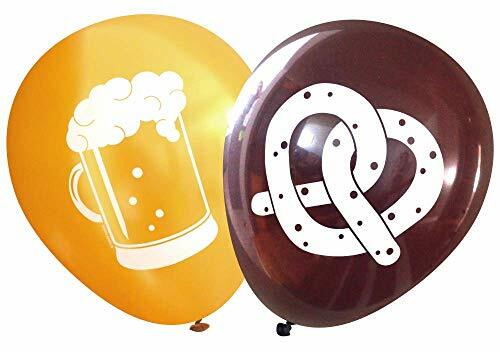 The perfect balloon for your St. Patick's Day or alcohol party, this Betallic party balloon is great for setting the scene! This balloon includes a self-sealing valve, preventing the gas from escaping after it's inflated. The balloon can be inflated with helium to float or with a balloon air inflator. Balloon arrives uninflated. Beistle 50804-B Metallic Wrapped Balloon Weights. Contains 12 Metallic Balloon Weights. Great item to hold balloons for your party event. These have a loop that make it easy to tie balloons onto. These blue Oktoberfest Latex Balloons feature the Oktoberfest lion with the imprint outlined in white. 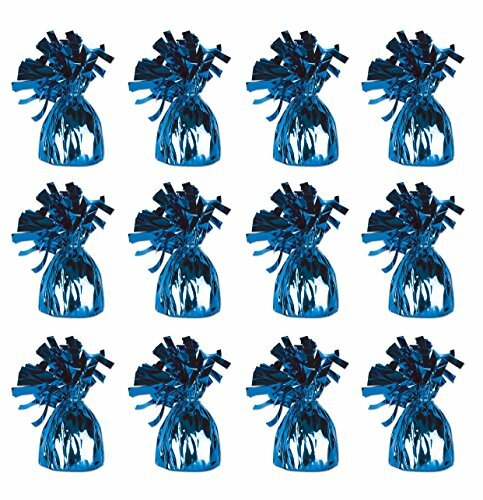 Each package contains twelve - 11" diameter latex Blue Oktoberfest Balloons. Create a fantastic centerpiece for your party by adding curling ribbon and a balloon weight. Latex Balloon Instructions: Our latex balloons are helium quality and will arrive uninflated. When inflating latex balloons with air or helium, we recommend inflating until the balloon has a tear drop shape. Be careful not to under-inflate (round in shape) or over-inflate (pear shaped) for maximum flying times. Latex balloons can be sealed by knotting, tying the balloon neck or using our one of our balloon closures. The float time for each latex balloon filled with helium is approximately 5-7 hours. 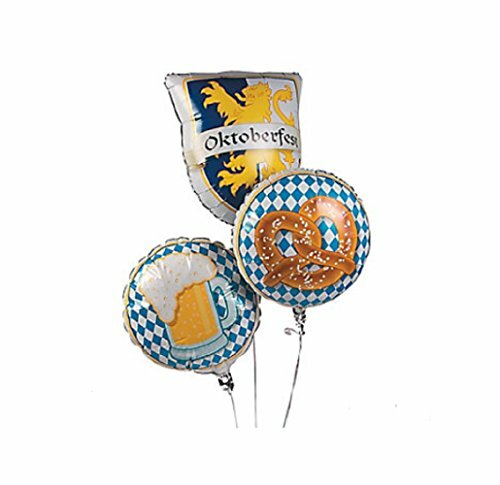 Get ready for any Oktoberfest celebration with this Mylar Balloon Set. Featuring a mug of bear, an Oktoberfest sigil and a pretzel. Add them to the rest of your Oktoberfest decorations and party supplies and get ready to go Deutsch. (3 pcs. per set) 18" - 20 3/4"
Accent Cushion Cover with digital printing. Dimensions: 16 by 16 Inches. With Hidden Zipper. These unique designs match well with various color palettes of your sofa, couch, bed, bedding, rugs, curtains, bench, seating and all other decor accessories. Perfect for your home, office, playroom, kids room, cafe, study, studio, club, bar and others. Very durable and environmentally friendly, no dye substance harming the health of you and your family. Colors won't fade thanks to new digital printing methods. A perfect gift idea for your mom, dad, sister, brother, grandma, wife, husband and all other beloved ones with many of surprising designs. You can find a design for everybody and every interest in our Ambesonne Collection. They will be shocked by the superior quality of the item when they open the present. Customized, personalized products are very popular. As manufacturers of digital printed home textiles, we follow current trends and bring you the latest home fashion. Either a gift to your family or friend, relative or boyfriend girlfriend, or to yourself, the item should be interesting and authentic. The digital images we display have the most accurate color possible, however due to differences in computer monitors, we cannot be responsible for variations in color between the actual product and your screen. Due to manual measurement, please kindly allow 1-2 cm discrepancy. This is ONLY the pillow cover, sold WITHOUT the insert. These stylish and original APRONS will have you feeling comfortable and looking good while you show off your skills! They are made from high quality %100 premium polyester fabric and have an adjustable neck for ultimate comfort. Standard size will fits most adults. Comfortable for men and women. They have black straps and ties. WATERPROOF and very durable. Perfect for indoor & outdoor use. Highly Unique. Versatile. FUN. With tens of 1000's of fresh and fun designs these cool aprons are perfect for any occasion, activity and task like cooking, baking, gardening, arts & crafts, housewarming, parties, grilling, serving, cleaning, painting and many more. Ideal for home, commercial and industrial uses. Suitable for adults, men, women, waitress, waiters, artists, chef, butchers, hostee or even use them for festive costumes. Ideal for home and business. Environmentally friendly, no dye substance harming health of your family. Colors won't fade thanks to new digital printing methods. It is a perfect gift idea for your wife, husband, best friend, mom, dad, sister, brother, grandma, colleague and all other beloved ones with many of surprising designs. Customized, personalized products are very popular. As manufacturers of digital printed design products, we follow current trends and bring you the latest hot fashion products. Either a gift to your family or friend, relative or boyfriend girlfriend, or to yourself, the item should be interesting and authentic. CARE INSTRUCTIONS: Machine washable; with mild detergent and water; Do not bleach. Dries fast. The digital images we display have the most accurate color possible, however due to differences in computer monitors, we cannot be responsible for variations in color between the actual product and your screen. Proudly designed & printed in the USA. Accent Cushion Cover with digital printing. Dimensions: 18 by 18 Inches. With Hidden Zipper. These unique designs match well with various color palettes of your sofa, couch, bed, bedding, rugs, curtains, bench, seating and all other decor accessories. Perfect for your home, office, playroom, kids room, cafe, study, studio, club, bar and others. Very durable and environmentally friendly, no dye substance harming the health of you and your family. Colors won't fade thanks to new digital printing methods. A perfect gift idea for your mom, dad, sister, brother, grandma, wife, husband and all other beloved ones with many of surprising designs. You can find a design for everybody and every interest in our Ambesonne Collection. They will be shocked by the superior quality of the item when they open the present. Customized, personalized products are very popular. As manufacturers of digital printed home textiles, we follow current trends and bring you the latest home fashion. Either a gift to your family or friend, relative or boyfriend girlfriend, or to yourself, the item should be interesting and authentic. The digital images we display have the most accurate color possible, however due to differences in computer monitors, we cannot be responsible for variations in color between the actual product and your screen. Due to manual measurement, please kindly allow 1-2 cm discrepancy. This is ONLY the pillow cover, sold WITHOUT the insert. Fabric Picnic Tablecloth with digital printing. Made from high quality 100% polyester fabric with hand-sewn finished edges. Suitable for outdoor and indoor. Measurements: 58 INCHES WIDE x 84 INCHES LONG. Spill proof and Waterproof. Printed by state of the art digital printing technology. No color fading in time. Very durable. Stain resistant and long lasting. Machine Wasable. These unique designs are perfect for casual gatherings in your garden, summer tables, backyard picnics, BBQ dinners, patio lunches, outdoor parties or picnic tables. Great for everyday use in indoor and outdoor especially with your children and grandchildren. They will brighten up your table and bring a refreshing touch. With tens of 1000's of fresh and fun designs you can find the right tablecloth to match with any tableware, napkins, place mats and for any occasion and every event at home, party house, hotel, restaurant, cafe. Environmentally friendly, no dye substance harming health of your family. Colors won't fade thanks to new digital printing methods. A perfect gift idea for your mom, dad, sister, brother, grandma, wife, husband and all other beloved ones with many of surprising designs. They will be shocked by the superior quality of the item when they open the present. Unique. Genuine. FUN. Customized, personalized products are very popular. As manufacturers of digital printed home textiles, we follow current trends and bring you the latest home fashion. Either a gift to your family or friend, relative or boyfriend girlfriend, or to yourself, the item should be interesting and authentic. CARE INSTRUCTIONS: Machine wash on cold delicate cycle with mild detergent and water; Do not bleach. Due to manual measurement, please kindly allow 1-2 cm discrepancy. The digital images we display have the most accurate color possible, however due to differences in computer monitors, we cannot be responsible for variations in color between the actual product and your screen. Girls doing various things on stage at Alpine Village's Oktoberfest Chicken Dance Balloon Blowing Contest Sausage Eating Contest at 0:54, the announcer will take spill on stage which distracts the other contestants. Todays gameplay was from Six Flags Fiesta Texas where we played a Carnival / Boardwalk Style Balloon Dart Game and win a Pikachu pillow! Dont forget to comment, like and subscribe for more videos and winning!